Years of planning and coordinating culminated with a few public acknowledgments lasting just a little longer than the time Caltrain doors stay open during a stop at the South San Francisco station. But following state, regional and city officials digging their ceremonial shovels into loose dirt during a groundbreaking, Monday, Nov. 6, construction on the new South City station is now on track. According to the project plans, the existing station will be replaced with a new center boarding platform leading to a pedestrian underpass connecting travelers to downtown South San Francisco, at Grand Avenue and Poletti Drive. The improvements will also make the station fully compliant with Americans with Disability Act standards. In fact, the station will not be ADA compliant. The “new” station continues Caltrain practice of building low platforms that do not provide level-platform boarding. Wheelchair users, and others with mobility issues, will have to use a wayside lift. FRA regulations require level platform boarding at newly built stations. It is curious that the FRA rejected plans for new stations at places such as Roanoke and Milwaukee due to platform interface issues, but apparently signed off on this deficient design at SSF. Level platform boarding benefits not just wheelchair users but all train passengers. Trains get seriously delayed when conductors must hoist wheelchair riders onto trains. Level boarding also speeds up loading of bicycles, rolling suitcases, etc. Level boarding is a key part of the Caltrain Modernization Project. Caltrain even ordered specially built trains with doors at two levels for this purpose, the but SSF platforms won’t line up with either of the door levels. Today Caltrain announced that it has negotiated an extension of the deadline for contractors to begin construction of the Peninsula Corridor Electrification Project while the agency awaits a decision from the Federal Transit Administration about the execution of a $647 million funding agreement. The contractors agreed to extend the deadline for four months, from March 1 to June 30. The extension does not come without cost implications. Buying additional time from the contractors will likely require the utilization of up to $20 million in project contingency that otherwise would have been available for construction related expenses in the future. Under the blended plan, Caltrain and high-speed rail are supposed to share tracks and infrastructure. And yet, for completely inexplicable reasons, Caltrain is installing a PTC signal system incompatible with HSR. Other blogs have already reported on problems this will cause for wheelchair and bike access, so I won’t go into that here. The really big issue that I have not seen mentioned is the dwell time. Note how the high door would probably only be half-width. That is because having 4 wide doors reduces the structural integrity of the railcar. This will double the dwell time at the Transbay Terminal, and other busy stations. By comparison, BART’s next-generation railcars will have 3 double doors. The constricted vestibule area also doesn’t help matters. Though if there is one silver lining, the crowded vestibule space precludes having on-board bathrooms — which is probably why staff wants to eliminate all the ADA bathrooms. The thing is that “blending” commuter and high-speed rail isn’t exactly a new concept. It is done all over the world, and I struggle to find even one example where an agency took this approach for shared platform access. Well ok, there is one example: NJT and Acela — but that just goes to prove the point. The Caltrain Board Member who wanted to ban bikes entirely from trains and presided over the Board during its most dysfunctional years is now Caltrain’s new General Manager. As you probably know, Caltrain and the CHSRA are supposed to share infrastructure but can’t agree on a common platform height. The CHSRA train specification is for 1295mm (51″) floor height, That is much too high for Caltrain with its legacy 8″ platforms. If you are wondering where the CHSRA came up with the 51″ number, the answer is that it was mainly a political decision. The FRA wanted California to use HSR rolling stock compatible with the NEC corridor (even though the NEC is thousands of miles away). When that idea proved impractical, the joint bid was dropped. And yet here we are, apparently stuck with the 51″ requirement. What needs to happen now is for the CHSRA to drop the 51″ requirement from the train specification. Since Caltrain and the CHSRA will almost certainly use European “off-the-shelf” trainsets, the obvious solution is to follow the European platform standard. In 2002, the European Commission issued a Technical Specification for Interoperability (TSI) that allows for two possible platform heights: 550mm and 760mm. If you do the metric-English conversion, you find that 550mm is 21″, and 760mm is 30″. For comparison, Caltrain’s Bombardier cars have a 25″ floor level. So trains built to either the 550mm or 760mm platform height would provide backwards-compatibility to legacy 8″ platforms while the agency works on rebuilding platforms to the new height. Following the TSI platform standard is also in the best interests of the CHSRA, because it will ensure the largest number of vendors can bid on high-speed train procurements. In a 2009 white paper, the CHSRA planners tried to argue otherwise, saying that most HSR trains currently in operation fall within the range of a 45″-51″ height. That is certainly true, but they need to think about the state of the market in the year 2024 (when California’s system supposedly begins operation), not the year 2009. 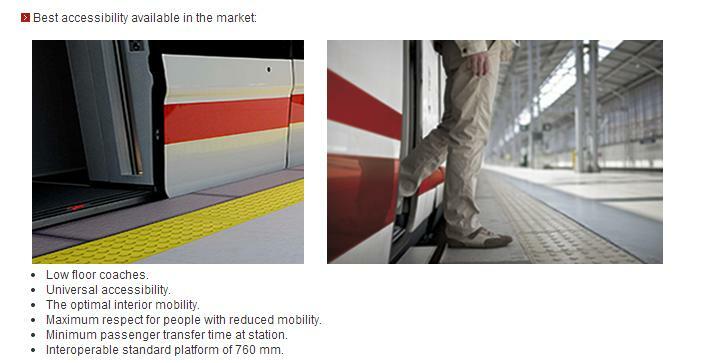 It is clear that the next-generation of HSR trains are going to be compliant with TSI accessibility standards. The new Stadler EC250 is also low-floor. It will operate on new high-speed service between Zurich, Frankfurt, and Milan, though only with a maximum speed of 155mph. The TGV duplex is yet another train with 550mm level-platform boarding. Even though it is the workhorse of the TGV network, the CHSRA has already ruled out the use of this train, saying it has “unappealing aesthetics”. It is incredible that the CHSRA would so blithely dismiss Europe’s most popular high-speed train. One HSR vendor that does not offer TSI-compliant trains is Siemens. Siemens does, however, have a train manufacturing facility in Sacramento and has made grandiose promises of local jobs if it wins the contract. This leads to the suspicion that specifications were written to favor a preferred vendor — at the expense of taxpayers and transit riders. If the CHSRA prevails on using 51″ platform boarding, the implications would be quite bad for Caltrain. There would be no good options for migrating to that platform height. 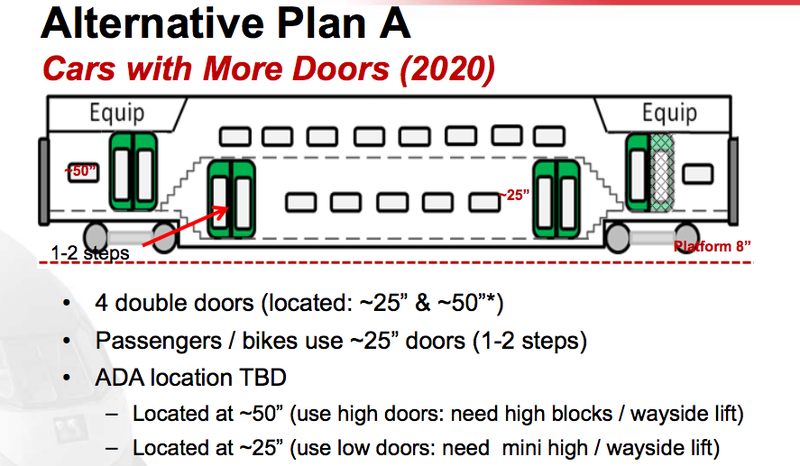 Caltrain would either have to decide on segregated platforms for HSR (limiting its access to the new Transbay Terminal) or else design some goof-ball train with two sets of doors. Sadly, it appears Caltrain is going with the latter plan. In a presentation last month to San Francisco officials, Dave Couch of Caltrain outlined a plan whereby the new electric railcars would have dual sets of doors. One upper set for stations with 51″ platforms, and a lower set of doors for the legacy 8″ platforms. This is a huge step backwards from what customers have today. At least with the current rolling stock, riders only have to make one (small) vertical transition. The new rolling stock would add yet another — inside a crowded moving train, no less, where there are also bikes and luggage to contend with. To accommodate wheelchairs, some kind of internal wheelchair lift may be needed too. And a train with dual sets of doors isn’t exactly off-the-shelf, so expensive customization would be needed. This proposal is so ridiculous, it is hard to believe it is being taken seriously. Let’s hope it leads to a re-evaluation of the CHSRA platform decisions. As part of the “blended” plan, Caltrain and CHSR will be sharing the same tracks and stations. It would be a no-brainer for trains to have compatible platforms, right? Indeed, staff from both agencies announced (just days ago) that they would be doing precisely that. And yet someone at the CHSRA didn’t get that memo. In a spec published just yesterday, the HSR trains are to have a floor height of 1295 mm (51 inches). This spec will serve as the basis for a train procurement process that has now begun. 1295mm is incompatible with Caltrain requirements. It really makes no sense — other than being compatible with the NEC. Why are they trying to maintain backwards compatibility with a rail line thousands of miles away? Besides the platform height, there are other problems with the HSR train spec. These “off-the-shelf” trains are supposed to comply with both Buy-America and Buy-California rules — even though there are no high-speed manufacturers in California or the rest of the country. It may not be optimized to have all trains running at 350 Km/h, particularly those trains with several intermediate stops. Very high speed is only needed on a long distance range and/or when high-speed rail is competing with air. The 2014 Business Plan optimistically predicts LA-SF route will not be in service until at least 2028. Realistically, it will be decades before LA-SF is in service. Until then, the CHSRA would be running a strictly regional service — and regional services do not require extremely expensive HSR trainsets.